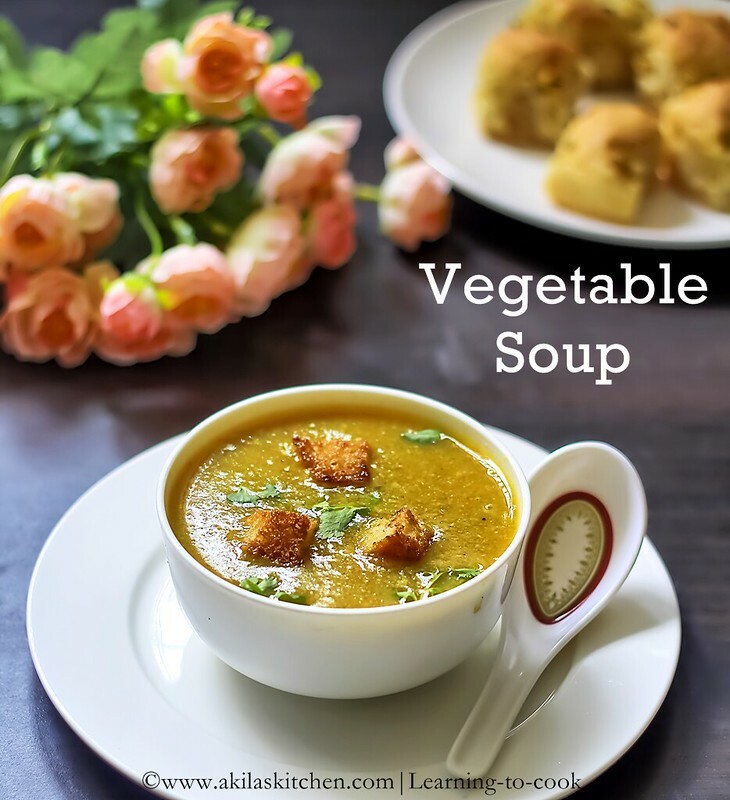 Thick Vegetable soup is one of my favorite and comforting soup which I used to prepare when any of my family members gets cold. I also feel at least this way, my kids have vegetables in their food. I used to prepare clear vegetable soup and creamy version too, but I love this one more. 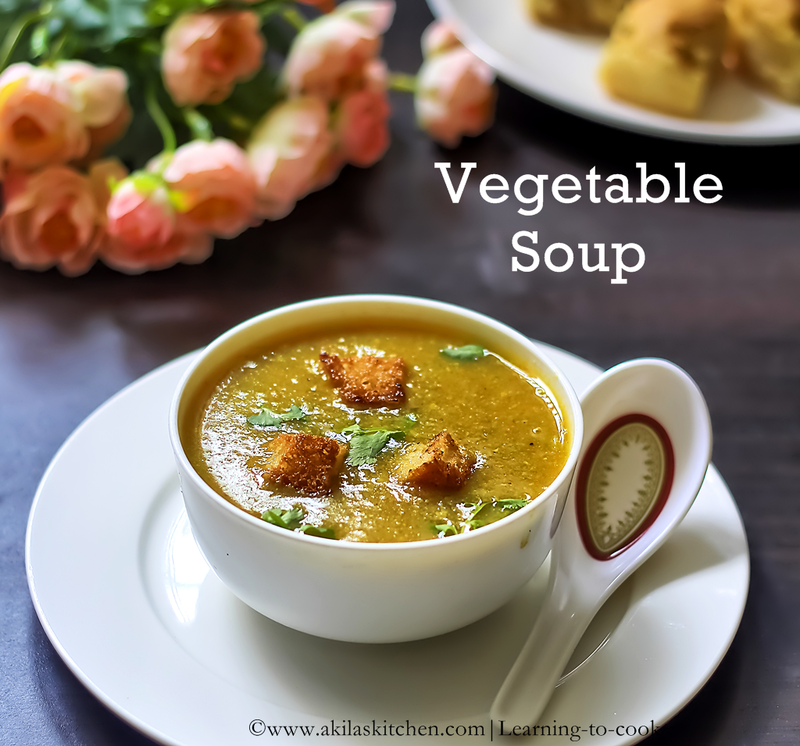 This is Indian version of Vegetable Soup. I added fried bread pieces, which adds more flavor to the soup. Vegetables – 1.5 cup ( I used, carrot, beans, corn, peas, green bell peppers, cabbage ). 1. Wash and Cut the vegetables into small pieces and keep aside. 2. In a kadai / vessel, add the oil and add the onion and green chillies and saute for a while. 3. Now add the vegetables. Saute for a while. 4. Add 1/2 cup water and let the vegetables cook for a while (3/4th cooked) and strain the water and keep the water. 5. Now grind the strained vegetables to a smooth/coarse paste and keep aside. 6. In another big vessel, add 1 litre water and add the vegetable stock and mix well. 7. When it is fully mixed, add the ground vegetable paste and the strained water. 8. Allow to cook and let it boil for 10 min. 10. Meanwhile, mix the corn flour with 3 tsp of water and add it to the boiling soup. 11. After adding soup, more foam forms on the upper layer, and if you do not wish, can remove it. 12. in another pan, add 2 tsp oil and fry the bread pieces, and add to the soup. 13. 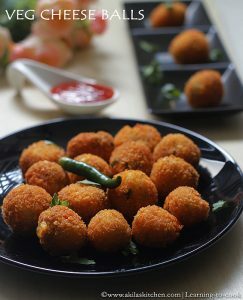 Garnish with some coriander leaves, if you wish. Serve the super comforting hot and Thick Vegetable Soup. My green chilli is very spicy so i added only one as it suits our family taste. The store bought vegetable stock have salt by itself, so, while adding salt check it first and then add. This one bowl of soup looks so hearty and warm and delicious. I loved the flavours and the color of the soup. I think Maggi Stock has "caramel colour" as an ingredient and this is carcinogenic. Please check on the same. 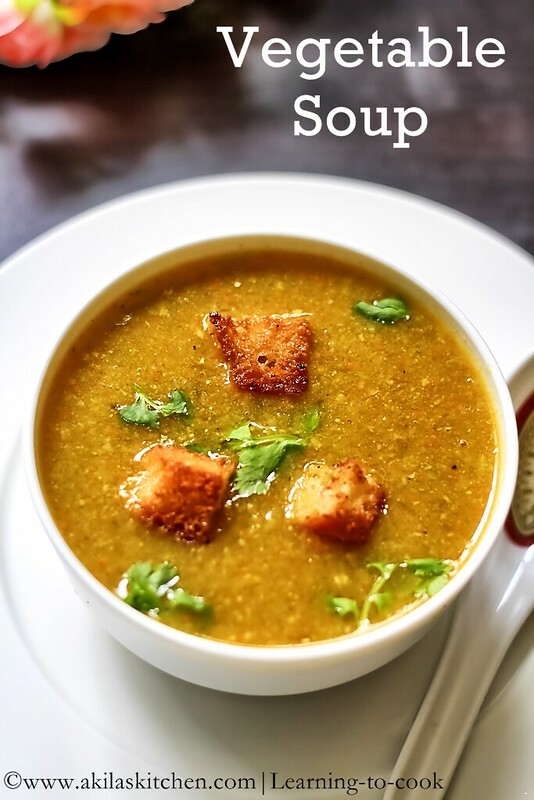 Such a filling soup, quite inviting. 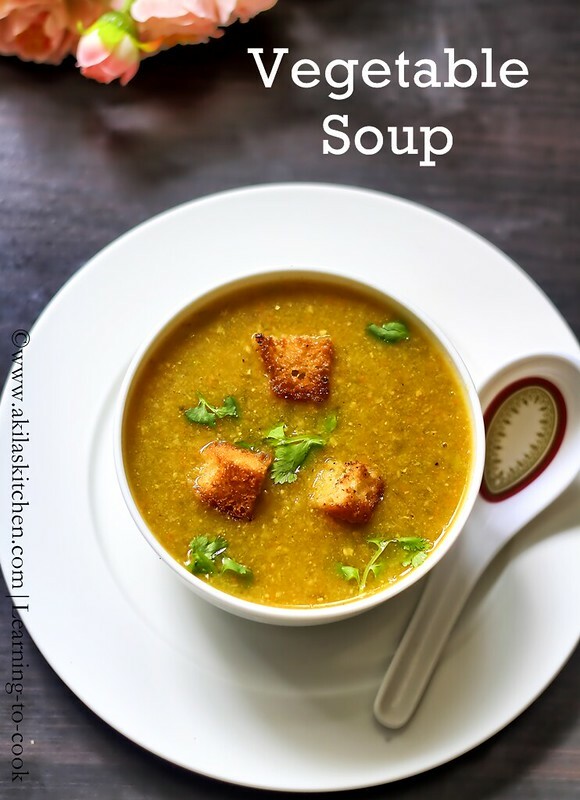 Healthy and yummy soup, looks inviting. 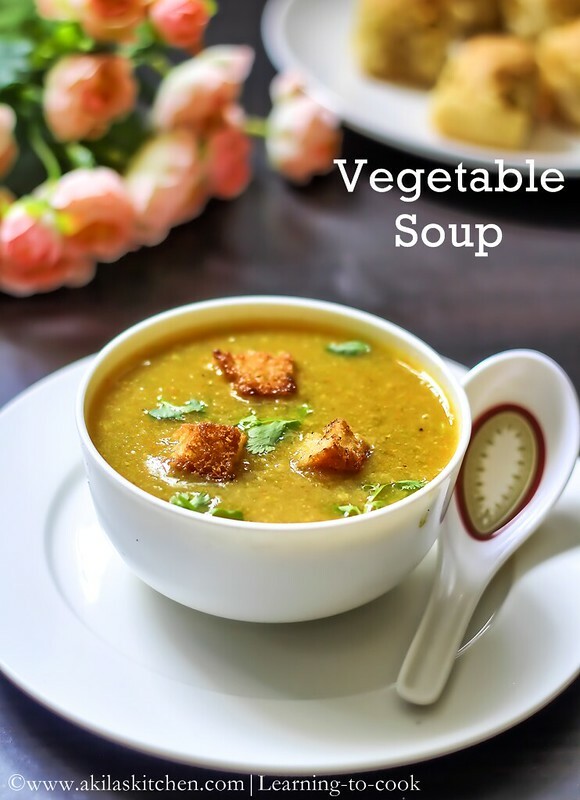 Vegetable soup looks very tempting. Would love to have that bowl of soup. Would love to try the soup, but the Maggie vegetable stock is the key ingredient I guess and unfortunately I don't get it here! ….hmm!